Torn between the old trusty phone system and a new one which could come with a high price? You don’t have to be. In fact, being complacent with your traditional telephony system actually means you’re spending more, with the monthly phone bills that are getting out of hand. It’s time to ask us about the VoIP (Voice over Internet Protocol) solution. This allows you to make and receive calls through the Internet, instead of your local phone company. And since it’s Internet-based, you can communicate with clients and staff whenever and wherever you want. 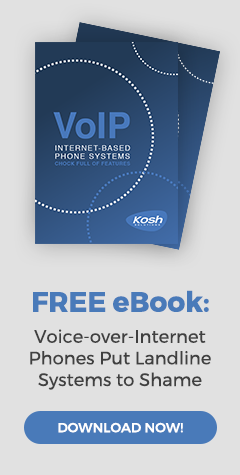 Kosh Solutions’s VoIP solution has all the enterprise-level features and comes at a price that won’t break the bank. By integrating VoIP into your business processes, you’re not only improving communication, but also enhancing collaboration and saving more money. Don’t be left behind in an increasingly globalized business world. Get VoIP today.